File photo of Chrysler Museum of Art's Third Thursday art performance. Photo: Echard Wheeler for the Chrysler Museum. NORFOLK, VA.- The Chrysler Museum of Art has joined forces with Work Program Architects of Norfolk to perform feasibility studies for a possible expansion of the Perry Glass Studio building, Museum Director Erik Neil and WPA Principals Thom White and Mel Price jointly announced today. 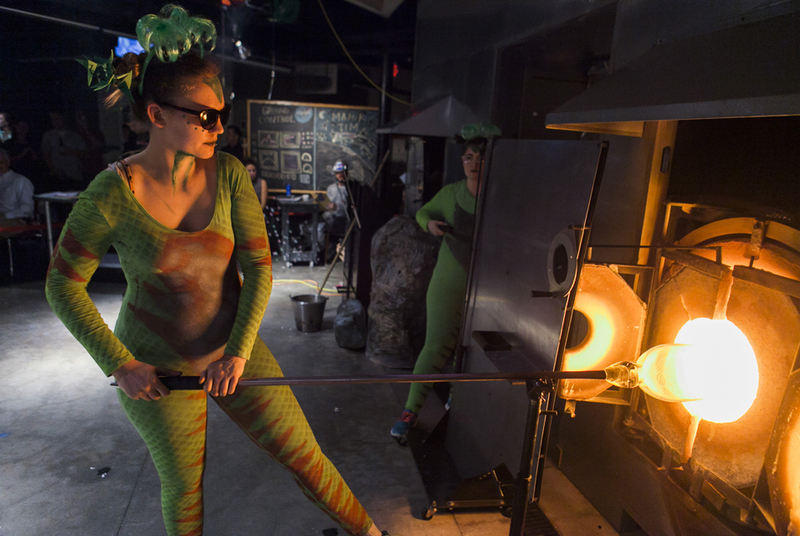 The Perry Glass Studio, now in its fifth year, has surpassed the Museums original expectations for its success, prompting the exploration of creating a larger facility to accommodate its growing educational demands and opportunities for new programs. WPA is a full-service architecture, interior design, and planning studio with offices in the historic Monticello Arcade in Downtown Norfolk. Their expertise includes all scales of architecture, urban design, master planning, and sustainable and resilient design. The award-winning firm is also lauded for its reputation for creative collaboration with its clients, and for LEED certification in energy-efficient green building practices. The groups experience with both the Chrysler Museum and Downtown Norfolk and the citys growing NEON (New Energy of Norfolk) Arts and Design District are especially valuable. Both the Chrysler Museum of Art and its glass studio play a critical role as anchor locations within the NEON District. The Perry Glass Studio was launched in 2011 as an educational complement to the Chryslers comprehensive collection of glass. The popular state-of-the-art facility offers classes in the many processes of glassmaking and serves novices and master artists alike. In addition, the Perry Glass Studio has garnered a reputation for innovative uses of glass in the performing arts. These successes and the areas burgeoning arts scene earned the Chrysler and the City of Norfolk a prestigious honor: selection as co-hosts of the 46th Annual Glass Art Society Conference in June 2017. Work Program Architects emerged as the Museums choice for the expansion research project through a competitive search. Each of the local, regional, and national firms invited to participate is known for its experience with similar expansion projects, according to Museum Trustee Peter Meredith, who heads the Building Committee. He said WPA stood out for their research initiative, aesthetic creativity, community understanding, contracting networks, and professional expertise. The Museums Board of Trustees unanimously approved the selection on October 27.